Raspberries have been in abundance around here lately. This is the 3rd raspberry baked good I've made in about a week. I'm a berry fiend, what can I say? Tomorrow morning, at my new job, we're having a data checking party. I know, sounds like a thrilling time, right? I actually think it is, but I'm a nerd like that. When I volunteered to bring breakfast, I'm pretty sure my new coworkers thought I was kidding. Can't wait until they see that I don't mess around with the home-baked workplace goodies. I hope they stay fresh until then! 1. Preheat oven to 400. Grease 12 muffin cups or line with paper baking cups, set aside. 2. In a medium bowl combine flour, sugar, baking powder, and salt. Make a well in the center of the flour mixture, set aside. 3. In another bowl combine egg, milk, and oil. Add egg mixture all at once to flour mixture. Stir just until moistened, batter should be lumpy. Fold in 2/3 cups fresh or frozen raspberries. 4. Spoon batter into prepared muffin cups, filling each 2/3 full. 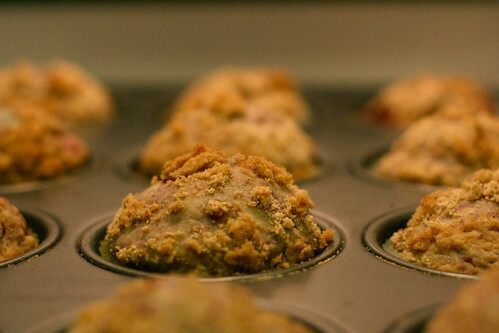 If desired, sprinkle streusel topping over batter in cups. Bake for 18-20 minutes or until golden and a wooden toothpick inserted in centers comes out clean. Cool in muffin cups on a wire rack for 5 minutes. Remove from muffin cups, serve warm. Combine 3 tbsp. all-purpose flour, 3 tbsp. brown sugar, and 1/4 tsp. ground cinnamon. Cut in 2 tbsp. butter until mixture resembles coarse crumbs. Stir in 2 tbsp. chopped nuts (optional). Oh I wouldn't mess around with home baked workplace goodies either! These look so good and sometimes fake "parties" like that ARE really fun! I love having any excuse to bake. People think I'm kidding too when I say I'm going to bake cookies and bring them to class. I love raspberries and streusel topping, they make muffins so much better. You got a really nice muffin top too!